This time of year I always find myself determined to stay in my Summer bubble, unwilling to acknowledge that another season is biting at Summer’s heels and wanting to enjoy every last minute with friends; especially outside as the sweltering heat starts to wane and days are almost perfect. Whether we convene on my patio, their home or even outside enjoying Happy Hour at a local watering hole I don’t want it to end. It will be cold soon enough and I’m not ready. So it seems fitting to wrap up the end of this month with our second Progressive Eats supper club hosted by my friend Liz from the blog ‘That Skinny Chick Can Bake.’ We’re celebrating with a Summer Barbecue filled with foods great for your end of summer or Labor Day event and for my contribution I’ve brought dessert. 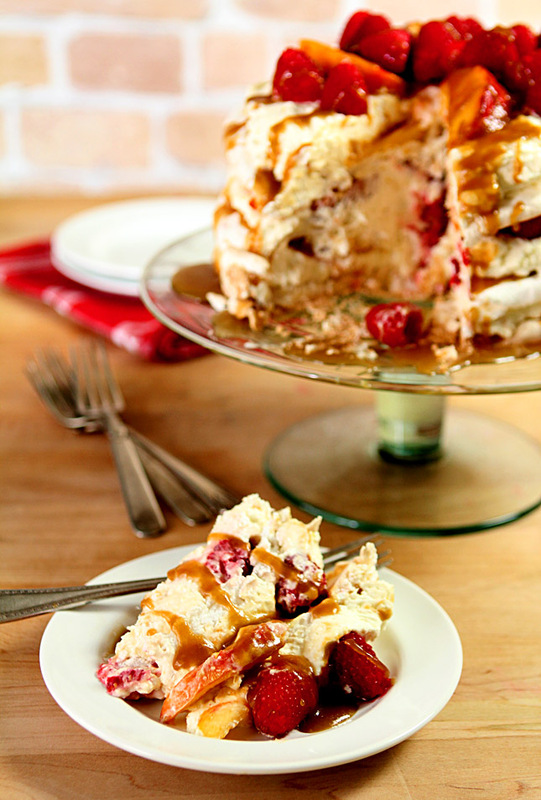 This Peach Melba Pavlova with Bourbon Caramel Sauce wraps up all the best of desserts in one package. Great presentation which always makes friends feel so special is combined with an amazing light, crisp treat filled with some of the best fruits of summer; peaches and raspberries. All layered with whipping cream and topped with some homemade bourbon caramel sauce. Yes…EASY. And every bit as good as it sounds! I’ve made a similar dessert for years called Raspberry Boccone Dolce that combines fresh raspberries and chocolate with baked meringues. It is so good and I almosts made it for this month’s Summer Barbecue event but then fresh peaches from the Western slope of the Rocky Mountains happened. We Coloradans think we have the best of all peaches. The warm days and cool nights of the peaches grown in Palisades, Colorado are amazing. Big, ripe, juicy and so sweet we simply think they are just the best. And they were a great idea for this summer dessert. 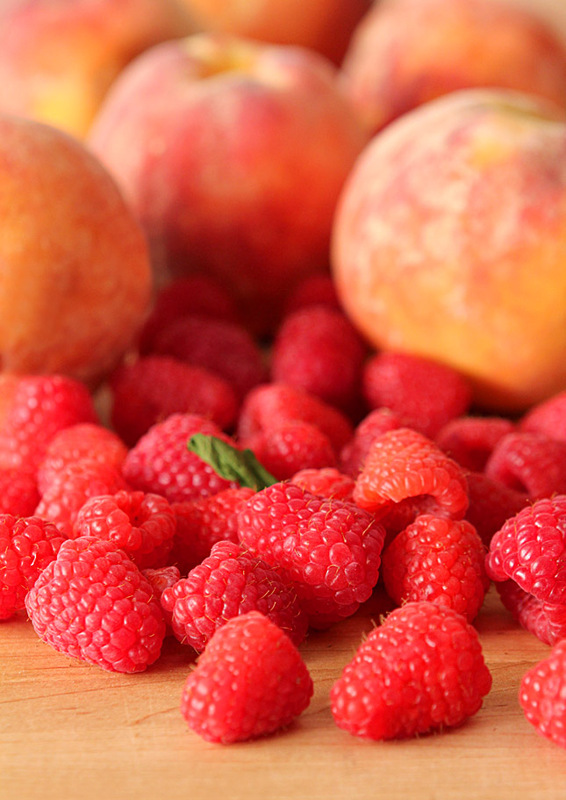 Peach Melba is typically a dessert of peaches and raspberry sauce with vanilla ice cream. The dish was invented in 1892 or 1893 by the French chef Auguste Escoffier at the Savoy Hotel, London, to honor the Australian soprano, Nellie Melba in 1892 when Melba was performing in Wagner’s operaLohengrin at Covent Garden. The Duke of Orléans gave a dinner party to celebrate her triumphant performance and Escoffier created a new dessert and displayed it using an ice sculpture of a swan, which is featured in the opera. The swan carried peaches which rested on a bed of vanilla ice cream and which were topped with spun sugar. In 1900 Escoffier created a new version of the dessert for the opening of the Carlton Hotel, where he was head chef. He omitted the ice swan and topped the ice cream and peaches with raspberry purée. Other variations of this dessert have used pears, apricots, or strawberries instead of peaches and/or use raspberry sauce or melted red currant jelly instead of raspberry purée. I was lucxky to have fresh raspberries and peaches and for my version opted for meringues and whipping cream instead of vanilla ice cream. Perfect choice I must say. You know what I love. It’s looks so fabulous but it’s SO easy. Ever made a meringue pie? For this dessert you simply spoon that meringue onto parchment paper that has 9″ circles drawn on them and they’re baked low and slow the day before. Make the caramel the same day so it can cool. 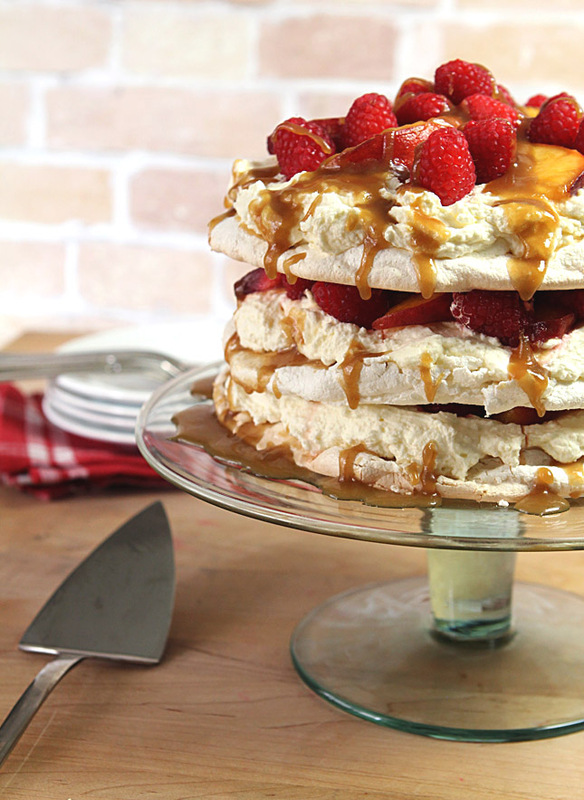 On the day of your party, simply layer the meringues with whipped cream and fresh fruit and some of that caramel sauce. Easy right? Elegant too. But the taste is what makes it so special. That perfect fruit with rich whipping cream and some crispy meringues and you’re got a show stopper for your end of summer fling! Before the show stopper though you need more. More fabulous food and the perfect summer drink with fruit spritzers. Make sure you check out my friends dishes that they are bringing to the party including another wonderful dessert; I want them all! Beat egg whites until frothy. Add salt and cream of tartar, beating until stiff. Gradually add sugar continuing to beat until the meringue is stiff and glossy. Line cookie sheets with parchment paper and trace 3 circles with cake pan, each 8 or 9 inches in diameter. Spread the meringue evenly over the circles and bake at 250 degrees for 35-50 minutes, or until the meringues are pale gold and still pliable. Remove from the oven and carefully peel the paper from the bottom. Place on cake racks to dry. The meringues may be made the night before. Mix all ingredients in a medium saucepan over medium-low to medium heat. Cook while whisking gently for 5 to 7 minutes until sauce thickens; remove from heat and allow to cool. Chill bowl and beaters. Put whipping cream into bowl and beat until thick; add the sugar and vanilla and continue beating until thick and soft peaks form. Slice the peaches and combine them with the brown sugar and lemon juice. Allow to sit; stirring occasionally. Smear a bit of the caramel sauce on a serving plate to hold the bottom meringue layer in place. Place meringue layer on top of sauce. Drizzle meringue with some caramel sauce. Spread 1/3 of whipped cream over caramel. Arrange a third of both peaches and raspberries on top of the whipped cream. Repeat two more times. 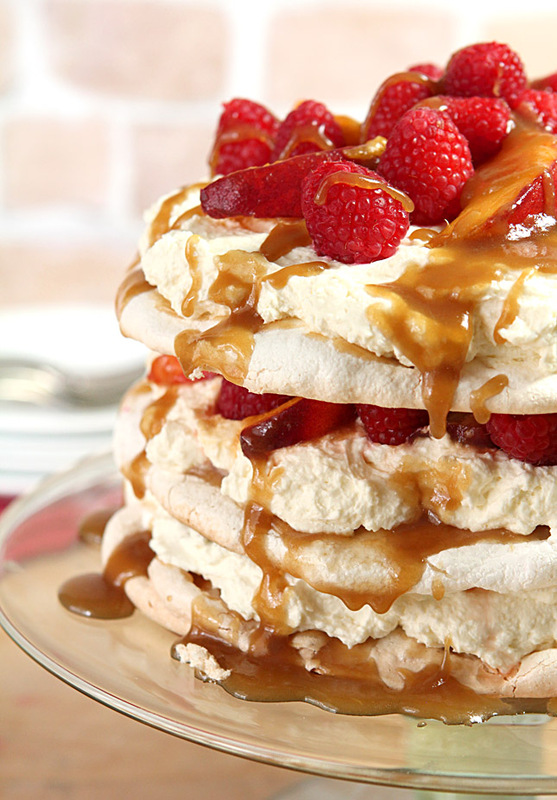 Meringue, caramel, whipped cream and fruit.